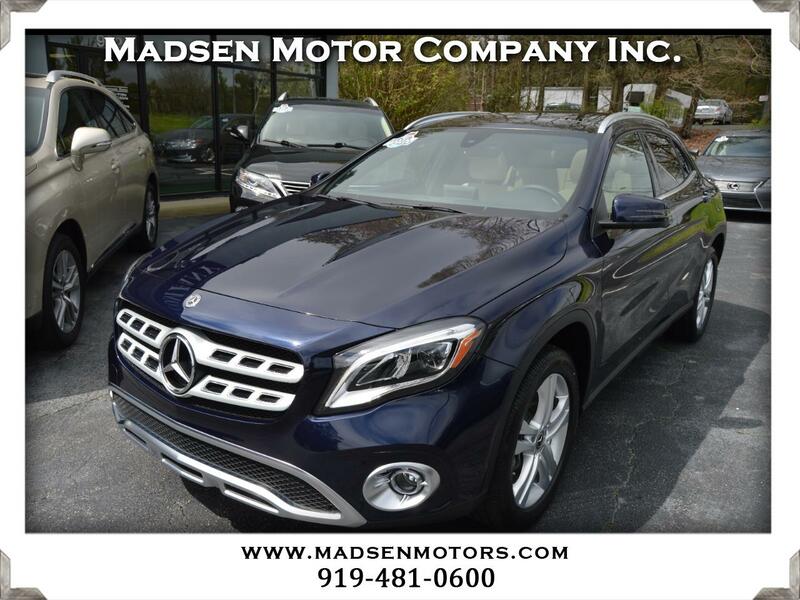 Used 2018 Mercedes-Benz GLA-Class GLA250 4MATIC for Sale in Raleigh, Durham, Cary NC 27511 Madsen Motor Company Inc.
Don't miss this stunning, low-mileage 2018 Mercedes GLA250 4MATIC in Lunar Blue Metallic with Sahara Beige Interior. This exceptional car has only is 13k miles and is well-equipped with Panorama Sunroof, Navigation System, Premium Package (Blind Spot Assist, KEYLESS-GO, Heated Front Seats, SiriusXM Radio) , Active Brake Assist, harman-kardon Surround Sound, Rearview Camera, Bluetooth Connectivity, and much more. It also comes with a clean CARFAX history and lots of MB Factory Warranty until July 30, 2022 or 50,000 miles, whichever comes first. Buy with confidence from Madsen Motor Company - voted ''Best Pre-Owned Car Store'' 4 years in a row in the Best of Cary awards!